There’s so much to love about Amazon’s new mini-series, The Tick, but first and foremost, for me at least, it boils down to this: I can finally see myself as a superhero. No, I’m not talking about the series’ namesake, as played with comedic genius by Peter Serafinowicz, although he is by every definition super; but rather, I’m referring to a man far more my own ilk, a man dwarfed by Serafinowicz’s sculpted blue Tick: the superhero known as Arthur, the short, neurotic geek, who would prefer to be doing anything other than superheroing. If you have ever wondered how Woody Allen would react to being a superhero, wonder no more; Griffin Newman’s genius portrayal of Arthur Everest, aka the far-from-smooth flying Moth Man, nails it. That Arthur is the hero of the six half-hour shows that comprise the perfectly packaged series is not a spoiler, regardless of what the title may tell you. 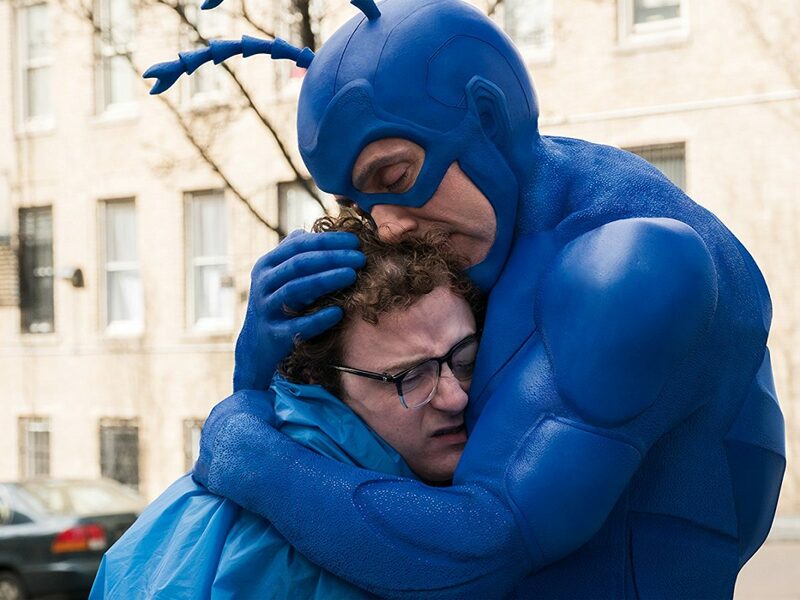 In fact, The Tick tells you as much, with his hilarious Captain Obvious dialogue, and also while serving as the show’s golden-throated narrator, relaying to the audience the highs and lows of Arthur’s origin story, which he equates, structurally speaking, to Joseph Campbell’s Hero’s Journey. These self-referential knowing nods from the creators to the audience really work, especially because as an audience member, you can tell these guys know and love their comic books, even as they make fun of them. But what would a spoof be without true knowledge of the genre, and plenty of love? For other comics-minded folks, The Tick has been in the world since Ben Edlund created the spoof superhero as a newsletter mascot for a chain of New England comic stores. With various helpers along the way, he created an independent comic book series starring the character in 1988, then hit the big time with an 1994 animated series on Fox and a 2001 live-action series on the same network, starring Patrick Warburton, aka Elaine’s face-painting boyfriend, Puddy, on Seinfeld. You’ll be excused if neither series crossed your radar, though, as the former only lasted four episodes, and the latter only nine. Since then though, Edlund has learned a thing or two, particularly from his work with Joss Whedon on Firefly and Angel, and from producing/writing Supernatural and Gotham, among others. And with 24, Buffy the Vampire Slayer, and Lost producer David Fury serving as The Tick’s co-showrunner, Edlund and team have truly hit their stride. The show is exceptionally well paced; the action and special effects work well, and keep things moving along; there’s an outstanding supervillain, The Terror, played by always-a-Bad-News-Bear-to-me Jackie Earle Haley; and bonus, there’s a “robo ninja” too! But it’s the relationship between The Tick and his “chum” Arthur that makes the whole thing work, really well, and makes me believe I have a crime-fighting future ahead. OlderCan Ozark Fill Some of the Void Left by Breaking Bad?